Samuel Ward & Eber Ward, Newport & Detroit, MI. 1877, Sep 17 Documents surrendered. 1877, Dec 13 Engine sold at auction at Detroit to Darius Cole. 1852, Apr 12 Enrolled Detroit, MI, cost $30,000; ran Detroit - St. Clair River, Saginaw & Bay City, MI. 1852, Aug 12 Collision with brig S.F. GALE, Lake Huron. 1853, Nov 23 Holed, Saginaw River. 1853, Dec 12 Raised; repaired Detroit. 1854, Aug Broke shaft, Saginaw River. 1855, Apr Aground, Hen & Chicks Islands, Lake Erie. 1855, Aug 5 Owned Albert E. Goodrich & D.G. Drew, Chicago, IL; first steamer of Goodrich fleet; ran Chicago - Milwaukee, WI & Grand Haven, MI. 1857, Mar 27 Sunk in collision with submerged wreck of schooner MCKAY, Chicago. 1857, Jun Renovated & repainted; ran tri-weekly Chicago & Grand Haven. 1860 Ran Chicago, Saint Joseph, Michigan & Saugatuck, MI. 1861, Apr Ran Chicago - Green Bay, WI. 1861, May Owned Darius Cole, Detroit; ran Detroit - Saginaw. 1863, Mar 12 Owned Vanevery & Rumball, Goderich, ONT; ran Goderich - Saginaw. 1863 Owned Edmund Trowbridge, Wilcox & Company, Detroit. 1865 167.5 x 23.4 x 10', 445.30 tons. 1865, Apr Ran Detroit - Goderich, ONT, occasional excursions to Saginaw. 1865, Jul Collision with unknown vessel in storm near mouth Saginaw Bay; rebuilt Bay City, MI; ran Toledo - Saginaw. 1866, Oct Ran Saginaw - Alpena, MI. 1867 167.5 x 23.4 x 10.2'. 1868, Jun 24 Owned Darius Cole & A. English, Saginaw, MI. 1869 Ran Saginaw, Detroit & Toledo, OH. 1869, Aug Chartered to run in peach trade Chicago - Saint Joseph River. 1869, Sep Ran Toledo - Put in Bay, OH & other excursion trips on River & Lake Shore Steamboat Line. 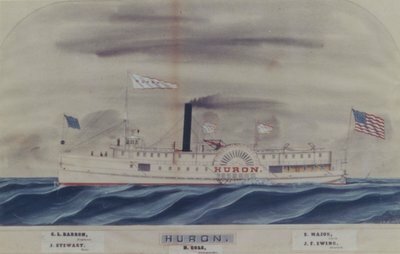 1871 Ran Port Huron & White Rock. 1871, Nov Broke cylinder & engine; laid up Detroit. 1872 Round trip Lake Superior; under Charter to circus company. 1872 Aug Repairs Clarks Dock, Detroit. 1874, Jul Owned George Hannah, South Haven, MI; ran Chicago, South Haven & Saugatuck.